A: The hair is Natural Color. All Items are for Real Shooting. A: If you're not satisfied with the hair, you can return the item back for Full Refund within 30 days. 360 Lace Frontal Wig is a versatile unit. You can wear it down or in a high ponytail ,It also has an adjustable strap for extra security,In the center of the wig ,the bundles are machine weft ,Each unit is about 150% in density,if u want 180% in density,just contact me,we can make it for u. EASY TO WEAR - The wig cap has adjustable straps to ensure a good fit. 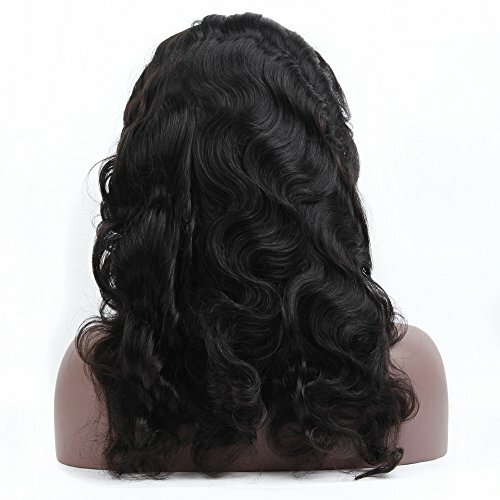 The lightness of the wig allows you to wear it for as long as you like without any discomfort. NATURAL LOOKING - The high quality Virgin Human Hair and perfect Lace Net give our wig a natural look. If you have any further needs, please don't hesitate to contact with us by email . wish you have a better shopping experience and better life from our store ! If you have any questions about this product by Queen Plus Hair, contact us by completing and submitting the form below. If you are looking for a specif part number, please include it with your message.